I'm getting used to be a lil more stubby, slower, i don't bounce onto the bed and have to crawl out of bed, i think i'm spotting a bit of a waddle (i'm ducking!!). So this is how i've grown since 2 weeks ago. I wonder when will this t-shirt be too small for me to fit in. Eliza's nudging these few days are getting more prominent, and it's fun feeling her nudges. Funny how she's more active on my way to work and back from work in the mrt. 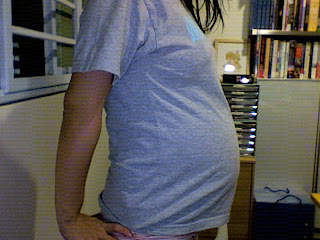 I wonder if ppl do see my belly moving...esp when Eliza seems to (i think) kick hard or hiccup hard. Sometimes her movement makes it hard for me to fall asleep too, sometimes i'll wake up in the morning when Ww wakes and feel her nudging. I wonder if it's her elbow, or her fist or her foot or whatever. We've completed our antenatal course at TMC where i learnt how to do some antenatal exercise (and barely practiced it outside classes...i'm so lazy!). Learnt about labour, nutrition, bathing baby & breastfeeding. it's always a rush from work cos it starts at 7pm (and my work ends at 630pm). but i thot it was ok la....at least Ww knows somethings too. There was a hospital tour but the teacher was saying that the hospital is busier after July and we only got to see the VIP and super single room (like a hotel room!). not what we can afford anyway it's too extravagant...anyway both of us like naughty students slipped away home after seeing the VIP room and guessing we won't get to see the normal rooms since it's like so full. wohh...that's quite a bit tho they were able to claim abt $2.1k from cpf. yawns...thank God for a peaceful night..no one's home, Ww went for a wedding dinner, the nephews have gone to chalet to play so i have a bit of time to myself...and i feel tired le. It's a 10week countdown to baby's arrival! We're still having our appointments at a 3-week interval which will reduce to a 2-week interval. 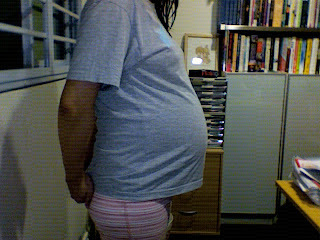 So far so good, thank God that baby Eliza's growing well. Just that err.r..i've gained 2kg in 3 weeks! :S and Eliza's gained about only 400g. not as much as previously tho so she's still quite an average size baby. Ww says it's good la..so not so difficult during labour. i think i was quite an average size baby too..abt 6lb. We somewhat gotta be on standby mid-nov in case baby decides to come out earlier so i really got get ready all the things! Haven't packed her drawers, wash her clothes, prepare her cot, pack the bag for the hospital stay, bought pajamas etc etc. and a great thing is that my gynae gave me 2 days MC to rest at home. :) because of all the tiredness, which is baby's way of telling me to take a break! (considering that last week was quite hectic being out after work everyday!). I'm still sleepy tho but the odd thing is when i lie to try to sleep i'm quite awake! argh! i was thinking i'm starting to adapt to a short sleep but frequent sleep pattern to prepare for baby's arrival. so 10 more weeks to persevere!! Meanwhile we've also decided on a Chinese name for Eliza...finally. 蔡智灵. simple and nice which means wise spirit. tho Ww once mentioned, what if baby turns out to be a boy instead? hahahaa...then we'll find a new name. i wanted to scan the last ultrasound scan but it's in Ww's organizer, this time she has still hidden her face frm us, allowing us only to see her left and right ear. it's quite hard to make out the ultrasound scans at times and the easiest part to identify is always her spine....still it's great to see her. :) maybe i'll try talking her to turn her head the next gynae visit. I've been really blessed to enjoy my 2nd trimester bouncing around, eating and just feeling kinda normal. ah...but i'm feeling the more tiring part...not the nausea...but tiredness. honestly feel fatigue in my muscles (or fats :S ), i'm not sleepy, just tired. it's difficult in the office after lunch when i'm struggling to keep awake, esp when i'm not really super busy. was telling my colleague that i wish there's a sofa bed somewhere i can just take even a 1/2 hr nap! I'm trying to sleep early..like fall asleep at 11pm? and hopefully 10pm soon. now going to sleep (aka be in bedroom trying to sleep) and falling asleep (hello dreamland!) is quite a big difference. it can take as short as 20mins to 1hr. sometimes i gauge by which was the last lullaby i heard. so this week i've been struggling with this sleeping and tiredness thing. it's a different tiredness from 1st trimester, when i'm tired i sleep and pop i sleep but now it's more of finding a comfy position to sleep and it's more difficult when i have late dinner (cos i have tuitions or classes in the evening), and have to keep sitting up to burp. oh so we've now put the speakers in the bedroom, we've been playing this lullaby cd to sleep every night, wonder if baby Eliza will recognize it next time :) i'm not very gd at singing in bed coz i'll croak eventually...so usually i'll talk to her a bit, tell her what we're doing for the day, or say 'gd morning' every morning and 'gd night' almost every night. daddy's been naughty and shaking her sometimes. of cos her movements have been more defined nowadays, poking around and i'll see my belly move or nudge one side. i wonder what she's doing inside. haha. 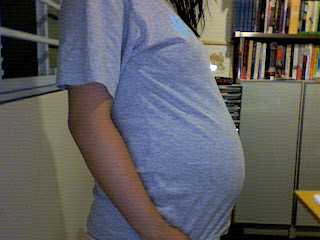 probably also because she's growing so much faster, it seems like there's lesser space inside. i'm still sooooo slow with getting the cot (also to spread our expenses) and sloooow with packing & washing baby clothes. but i'll plan to do that once my saturday tuitions are over. this is taken today...16 Sep.
yesterday was the first time i was hungry at late night, craving for fried carrot cake..at 130am. i have already rolled in bed for 1hr plus, lullaby songs all played thru...and found myself hungry so i made a slice of wholemeal bread + butter + half slice of cheese; only to find it so delicious that i made another one and read till i felt sleepy enough to fall asleep..it was prob 2am by then. oh the difficulties of sleeping at night! but afternoon naps are a bliss...i absolutely love afternoon naps! managed to catch it on sat & sun (all 2 hours plus of it of sleep), thank God! too bad i can't have aftnn naps at work so i'm like so drowsy in the afternoon at work :( only to go home tired out. Eliza has been quite active these days, feeling her rolling or nudging around more frequently which is really quite fun and makes me laugh sometimes. it's ticklish! and a happy feeling :D if you're lucky you'll get to feel her too cos i really can't predict when she moves though there's a sleep-wake pattern that she has but still.... sometimes i think she knows someone wants to feel her move and she deliberately doesn't move, mischievous gal! but unless you are carrying a baby, you won't feel it the way we mums feel our babies move in us. like what JF jie was saying, it's a privilege we women have that men don't. it does seem kinda scary having a life moving in our womb, (you know like all those younger days of watching horror shows...) but when it comes to our darling baby, handcrafted by God it's really a wonderful experience. 3) can't walk fast. i can walk really fast but now...i'm slowing down. 4) burping. it has come back a lil more than usual, i feel...the burping makes me feel a lil like vomitting...and freaks Ww out..even tho i tell him it's juz air. 5) eating. I can't eat as much as i could and smaller meals helps more coz baby's taking up more space so not a lot of space to fill with food. Eliza's movements makes me giggle...it's fun to to feel her move within me every night. (and through the day to...just that i don't have too much time to pay attention to her then).